The visiting students from Japan thoroughly enjoyed their visit to your farm. Than you for making their experience a positive one... Some people have a special gift for making sure that everyone has a good time. You are one of those people. Welcome to the Alpacas de la Patagonia Website. Proprietors, Karen Byram and Hugo Ulloa would like to invite you to pay a visit to their magical world of alpacas. Our goal is to breed conformationally correct, fine-fleeced alpacas in a wide spectrum of colors. 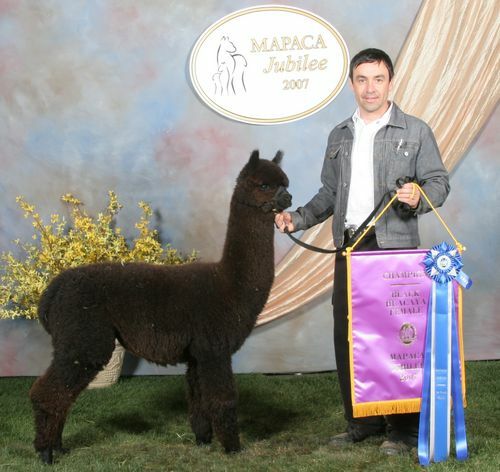 We have extensive experience raising alpacas in Chile, their native home. We bring this unique perspective to North America and are happy to share it with others. 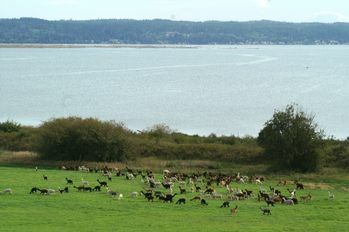 One of the most important aspects of our business is to help new alpaca breeders get started and to provide them with continuous support and education in their alpaca endeavors. Have a look around our site and enjoy. If you would like to get your hands in the soft fleeces of our alpacas, we hope you will consider a visit to our farm. We look forward to receiving your questions and comments. Our top studs, including Patagonia's Lennox are now standing stud at Patagonia Estates. Owner, Nancy Chapel has been slowly and carefully building a superb colored huacaya herd over the years. With the infusion of our top genetics, we look forward to seeing spectacular results. We would like to thank Nancy for recognizing and acquiring the best of our 20 years of hard work. For information on how to obtain these genetics, please visit Patagonia Estates.